Leeds is littered with bad coffee shops. They’re everywhere, on every corner, selling their burnt-out espresso watered down with a gallon of milk to disguise the terrible taste of the coffee within. In among all the multinational chains, there are a few independents, places serving the real deal and serving it with passion and skill. Opposite, La Bottega Milanese…you know I mean you, right? Two independents are just a drop in the ocean, but it’s a good start, and it’s great to see both doing well, with La Bottega set to open a new site in The Light and Opposite regularly whipping the upmarket competition in the Victoria Quarter on both quality and price. These two Leeds coffee heroes have just been joined by a third – Laynes Espresso. Sited on New Station Street, the sweeping street leading from the station to the city, several thousand people pass Laynes every morning, and for most of those people, it’ll be the first coffee shop they see in the city. In terms of location, it really couldn’t be better placed. The big task that Laynes have is to tempt people the short distance across the road and into the shop before they catch sight of Cafe Nero at the end of the road. One of the best ways to attract people is to use other people to do it for you, and in positioning a counter and stools right across the big front window, Laynes have created one of the city’s best people watching spots. The opposite is also true – people sat at that counter are a potent advertisement. Is there anything better for a food business than people being seen to enjoy your food? At the core of it all is something really simple. Carefully selected single estate beans that produce rich, smooth and powerful espresso, the sort of shot that won’t get lost in a latte, the sort of drink that people recommend to other people. I had a chat to Dave, the barista and owner, about the shop, and about coffee in Leeds. 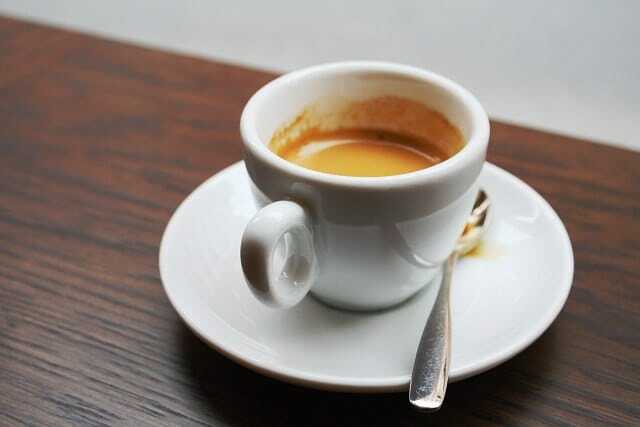 He agreed that there’s a tremendous level of interest in decent coffee, and that there are people out there who know and understand what makes a good cup of coffee. There’s clearly a market, and room for several independents. Dave talked in exactly the same way about coffee as the manager of Opposite’s Victoria Quarter kiosk did a couple of weeks earlier when I spoke to him, both passionate about serving good coffee, both with that glint in their eye that betrays the fact that they know their coffee beats the pants off anything a chain coffee shop could muster. I’ve argued before that the multinational coffee chains are actually a good thing. They break ground that small independents wouldn’t have a hope in hell of breaking on their own, and that seems to be what’s happening in Leeds. Starbucks et al have got people interested in coffee in a ‘safe’ way, and some of those people want to move to a more challenging, better quality drink. The market for coffee has been opened wide by the big players, who’ve given people like Laynes the chance to move in behind and tap into a rapidly maturing market by offering a better quality, more authentic drink. It’s this quality that drives word of mouth, and it’s word of mouth that makes many an independent successful. Laynes has quality in spades, and there’s a real buzz about the place already. Those commuters walking past every morning and evening have started to notice, and I’d guess that those who’ve nipped across the road have been surprised at just how good Laynes’ drinks are. A great cup of coffee does wonders. It may be so simple, but few things soothe and energize quite like that. Fantastic post. I was absolutely blown away by Laynes Ethiopian blend when I popped in for a Machiatto which was actually served properly for the first time since I was in italy. i.e. Double espresso with just a dash of light foam on top. Served in an espresso cup. I saw these two guys at last weekends Leeds Loves Food event in The light and their knowledge, enthusiasm and pride in their product was most refreshing and that was before the quality of the coffee was sampled. A must pit stop on my next forced shopping spree in Leeds!!! I am more of a tea lover. but, my husband is very fussy about his coffee and gets very annoyed when it’s not brewed properly. He would love this post! Decent coffee in yorkshire, at last, hooray. I live in Melbourne (australia) where great coffee is the norm and am always astounded by how dreadful the coffee is when i am visiting my yorkshire homeland. I hope all three of these businesses enjoy great success and look forward to a great latte on my next visit. Tea for me please. 🙂 My hubby drinks coffee and we get the best coffees here in the tropics.